Watch the forum and find out how the candidates answered. 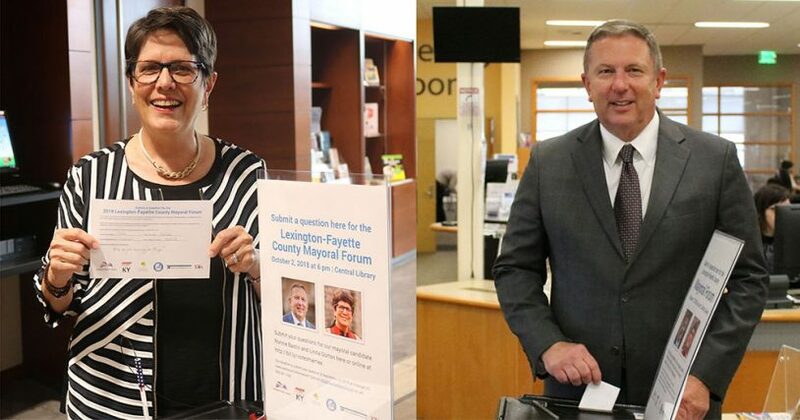 As part of our voter education program, we partnered with AARP Kentucky, Fayette County Farm Bureau, Fayette County Neighborhood Council, Kentucky Thoroughbred Association, the Lexington Public Library, and WKYT to sponsor a free, public forum featuring Lexington’s mayoral candidates, moderated by WKYT’s Bill Bryant, on October 2, 2018 at the Farish Theater within the Central Branch of the Lexington Public Library. Main topics of focus for the event were land use, neighborhoods, senior issues, and quality of life. The event was followed by a meet-and-greet in the Central Branch Gallery. The Candidate Forum is the cornerstone of our efforts to educate the public on where our future leaders stand on the most pressing growth issues facing Lexington-Fayette County. In addition to the live forum at Farish Theater, AARP Kentucky hosted a live watch party at the Lexington Public Library Northside Branch. The children’s area of the Central Branch had a screen for additional viewing and a recording is available online at WKYT.com.